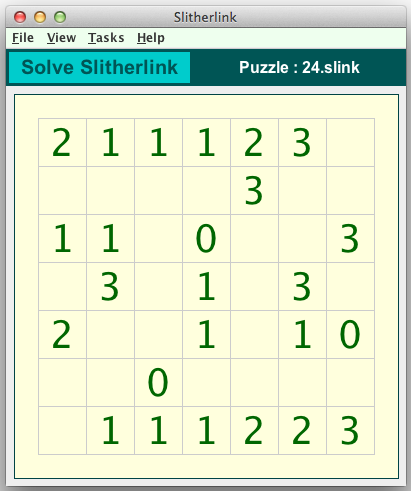 SlitherLink puzzles are normally built on a rectangular grid (although other shapes are possible). The grid is defined by an array of dots which represent the corners of the cells within the grid. Some of the cells in this grid contain a single digit number between 0 and 3 inclusive. The remaining cells are blank. To solve such a puzzle, the solver must join selected dots with horizontal and vertical lines so that a single loop is formed which does not cross over itself. If a cell contains a number, then that number of sides of the cell must be included within the loop. The puzzles have unique solutions, and no guessing is required to complete the solution. 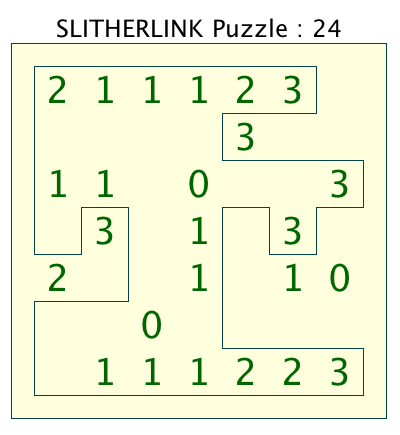 The following graphics show a Slitherlink puzzle in the Crossword Express Solve screen and a PNG graphic file produced by the program's print function, showing the complete puzzle solution. See also a full size version of a PDF file. Puzzles may be built in sizes ranging up to 50x50. An option is available to allow the construction of both symmetrical and non-symmetrical puzzles.